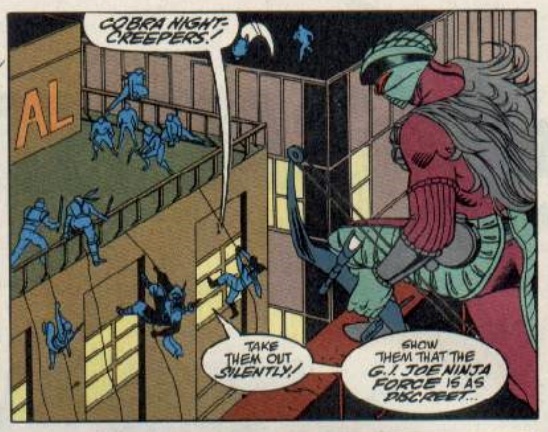 The second version of the Night Creeper that was released as part of the Ninja Force subset was disappointing. It has a big bulky torso common for its time, had an action feature instead of full articulation, and an ill-advised colour scheme to boot. When this version of the Night Creeper appeared in issue 141 of the comic, they had a much better maroon-and-green colouration, so I wanted to make a custom to reflect that. In the comic they also have the same sort of fur/feather cape thing that appears in the card art, but was not present on the figure itself (perhaps a last-minute decision to leave out an accessory). To represent this in the figure I modified a v2 Snow Serpent figure. I don't mind losing the original torso, since it was a very bland one, just muscles and a few grenades. I gave the figure a new name as well, so its not just a new outfit but a subset of the Night Creepers.